One interesting phenomenon I’ve noticed over the years is that many extended families, when they all congregate, have a card game that many members of the family play together. With my own extended family, for example, four point pitch is the card game of choice. With my wife’s extended family, the card game of choice is 500. At other gatherings I’ve attended, I’ve witnessed many impromptu games of contract bridge (which I love), euchre, canasta, and mao, among many others. Because of this, I have a large repertoire of card games under my belt, from children’s fare like Go Fish to complex games like contract bridge. Whenever there’s a chance, I can deal up and play. The best part? All you need for all of these things is a deck or two of playing cards, which you can grab anywhere for just a few bucks. Cards can be entertaining whether you’re alone or in a group. I know quite a few solitaire games and have found myself playing them many times over the years. At the same time, I’ve played Hold ‘Em with almost a dozen people at once before off of a single deck of cards. There are games that work well with almost any number (though many work best with four). Card games can be a great social lubricant for shy people. They provide lots of opportunities for small talk that can grow into a deeper discussion. They also give you a chance to understand people better. Card games can be effortless or they can make you think deeply. Some games, like Go Fish, can be played with virtually no concentration. Other games, like contract bridge, thoroughly work my brain cells. Even better, a game where you know the rules cold can be played at both levels – very casually or very seriously. 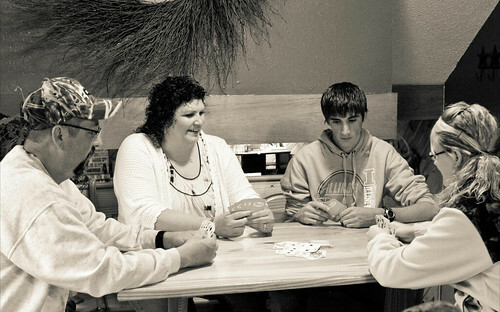 Card games can be played almost anywhere. I’ve played card games on a sandy beach. I’ve played them on top of an upside-down bucket. I’ve also played them in a very nice restaurant with linens. Card games work almost anywhere. Most games can be taught in just a few minutes. The basic rules are rarely too complicated, although the strategy of many more complex games can take a lifetime to master. I never go on a trip without packing a couple decks of playing cards. Whether it’s a rainy afternoon stuck inside a tent, a wait at a greasy spoon for lunch, or a lazy evening by the campfire, there are countless opportunities for a game of cards. At the same time, we always have several decks of cards floating around our house, providing perfect opportunity for gaming whenever we have guests or when it’s just the family and we want to have a family game night. I consider a deck of playing cards to be one of the best frugal investments a person can make.